Are you a big fan of the 1950's drive-in rock music and classic werewolf movies? Because Thunderkick has prepared something unique that will bring fresh memories of the sweet old days in their Full Moon Romance video slot. We are certain you will enjoy the exciting story of two teenagers on a date under the shadow of a full moon. True to their motto, 'We are Thunderkick, we make the game,' the graphics and visual animations are of high quality, and the soundtrack is excellent. Designed for HTML5, you can rest assured of flawless gameplay across all platforms including desktops, mobile and tablets. 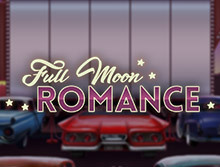 Although Full Moon Romance slot comes with a medium variance, there additional unique features such as free spins and clone expanded wilds to boost your chances of landing huge wins. The game layout is simple featuring five reels, three rows and 15 possible ways to win. With a bet range of $0.1 up to a maximum of $100 and a theoretical return to player of 96.1%, the chances of landing the highest payout of 150000 coins are high. Keep on reading our Full Moon Romance slot review to discover the payouts, wagering limits and where to play for free and real money. If you ever watched Teen Wolf movies from the 80s, then it's irresistible to play this video slot and not recall that thrilling movie. First, the playing screen itself invites you to the Eighties world, with the reels set on a background of a drive-in movie theater. The main characters are seated in an old fashioned convertible with enough space left between them. The exciting part of the game is that both love-birds will transform into were wolfs when the full moon rises. Thunderkick has been inspired by the romantic story of Jack and Rosie. The two sweethearts pack their car right under the enormous projector screen and relax for a beautiful show. To their astonishment, the full moon rises, and the most unexpected happens. Jack and Rosie turn into werewolves! As it is with Thundekick video slots, you will enjoy state of the graphics and visual animations as well as an immersive theme. The two lovers represent the symbols of the game, and they will pay out differently as shown on the pay table. The Gameplay of Thundekick's Full Moon Romance slot is exciting like the story it tells. The slot is played on standard layout of 5 reels, three rows and 15 win lines paying from the leftmost to the rightmost for landing three of a kind on the reel. This makes it easy both for novice and veteran gamers. You need to stake a minimum of 10 coins for every spin, and the highest possible bet is $100. All the betting options can be found at the bottom of the screen; the Total Cash option is in the lower left corner of the screen, Total Win right above it, and followed by the Cash Bet Value option. The Spin button is in the bottom right corner, but players can use the spacebar on the keyboard as well. To set you to bet, click on the 'poker chip' icon and you will be given an option to set the value of each spin. The Autoplay option allows you to play between 5 to 5000 consecutive spins uninterruptedly. Drive-ins were common in the 1950s and acted as best places for dates. This is precisely what is presented in Thunderkick's 2017 release, a wide cinema screen and the two darlings sitting in the drive-in. The eyes are fixed on the screen waiting for the Puppy Love movie or free spins to be set in motion. The most common symbols you expect on the reels are Jack and Rosie, and besides turning into werewolves during the free spins feature, they also pay the highest. 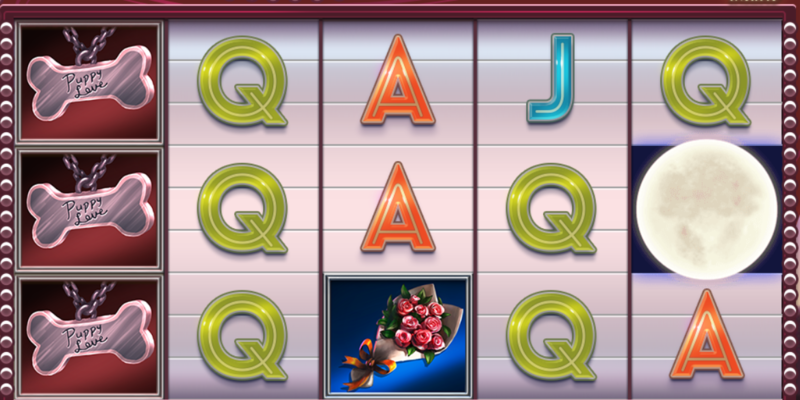 Other high paying symbols in the game are the Puppy Love Necklace and a Bouquet of Roses. The low value cards are also used, and they are represented by standard playing card letters J, K, A, Q. This symbol is represented by the world 'WILD'and it replaces for any other symbol except for the scatter symbol. The wild symbol will increase your chances of landing a winning combination on the reels. The Full Moon is the scatter symbol of the game and landing 3, 4 or 5 of a kind will reward 10,15 or 20 free spins. The two sweethearts, Jack and Rossie, will transform into werewolves during the free spins and they are counted as symbols. This feature is activated when either Jack or Rosie lands fully on the first reel. The symbol will clone itself up to a maximum of 4x once it is fully stacked on the reel. Given the two lovers are the highest paying symbols, you expect to win significant especially when you land stacked sweetheart symbol on all the five reels. Full Moon Romance on the Go! Thunderkick developers made sure that all slots lovers will have an opportunity to experience this thrilling game across all devices. The slot is built with modern technology like HTML5 which maintains excellent graphics and animations on smartphone and tablets. Additional features like the clone boost chances to win. Offers a maximum win of up to1005x the original bet. Free spins can be triggered during the bonus game up to 40 freebies. Medium variances mean low payouts in the main game. Thunderkick is a relatively young slots creator in the igaming industry. Since 2012, they have been developing unique themed video slots featuring a high payout and with numerous features. The Swedish company boast of building games with a high theoretical return to player of above 96%. You will enjoy their slot games instantly at some of the leading casino sites in the UK and around the world on mobile, tablets and desktops. Where else can you enjoy this romantic plot line than at bCasino? But why us? We are a popular UK based casino founded in 2018 by the GS Technology company limited. We provide games from the best-known software developers in the industry including table and cards, video poker, progressive jackpot and live dealer. Each of our games is tested by a third party company to ensure they are safe and fair. Customer safety is our top priority; as such, we use sophisticated technology including 128-bit Secure Socket Layer (SSL) encryption technology to ensure that sensitive information does not leak to hackers. Our site supports safe and secure payment options to enable fast deposit and withdrawals. Additionally, we have a highly trained team of support agents available via email, live chat and telephone to provide any help you may need along the way.